Home :: Patients & visitors :: Who is eligible? Anyone can receive emergency dental care (including non-concession card holders) through The Royal Dental Hospital of Melbourne. You can also access emergency dental care through your local community dental clinic if you are eligible. To access general dental, denture or specialist dental care through the public dental system, you need to be eligible. Examples of a Health Care Card and Pensioner Concession Card below. If you are eligible for public dental services, you may also have priority access to public dental care. People who have priority access will be offered the next available appointment for general care and will not be placed on the general care wait list. Where you have denture care needs, you will be offered the next available appointment for denture care or placed on the priority denture list, where applicable. If you meet any of the above criteria, tell the receptionist when you telephone to make an appointment that you may be eligible for ‘priority access’. They may still be able to get free dental care through the Child Dental Benefits Schedule. Dental care for 2-17 year olds are eligible if they receive Family Tax Benefit A or other relevant Australian Government payments. 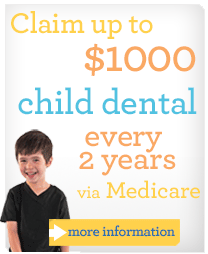 Find out more about the Child Dental Benefits Schedule.